Szerző: Skanzen 2018. április 11. The railwaymen and the conductors working on the railroad wear period costumes from the 1930’s. The train goes around the museum from the entrance; the complete journey takes about 30 minutes. 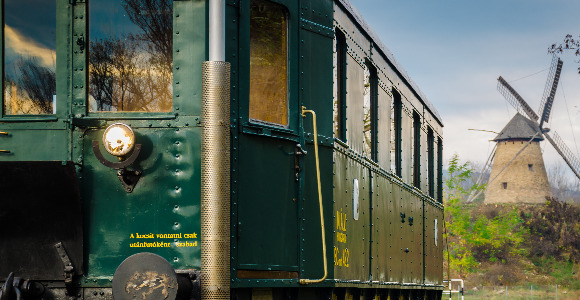 Our normal-gauge railway is the longest among the museum railways in Europe. It has five handicapable stops which provide easy access for people with wheelchairs, or for families with baby carriage. The Skanzen train operates between the Railway Station and the Study Collection. Waiting time varies (20 -30 minutes), depending on the number of passengers. 4 child and 16 adult bikes - 4 with child seat - are available for our visitors. Bicycles for both children and adults can be rented for 600 HUF per day at the information desk located in the entrance building. Over the age of 14 visitors can rent a scooter for 600 HUF at the information desk. Skanzen Carts can be rented for little children for 900 HUF at the information desk. The maximum wage is 40 kg.